Thanks to Lulu’s for the fab ankle boots. Links may be commissioned. I have a confession to make. I almost always wear flats. Part of it is ease of wear, part is comfort, but part is just that that’s what I reach for. Recently, a friend asked me if I even owned heels. When I showed them the shoe closet (okay, it’s really a couple shoe racks) they were astonished. I have all these amazing shoes that I never wear. And they issued me a challenge. The challenge was that I need to wear shoes other than ballet flats or loafers at least once a week. Immediately, I started to panic. What if I’m not going anywhere? What if it’s cold and icy? What about this or that or the other thing? The problem is, they’re right. I’m immediately drawn to the same things over and over again. And I’m breaking out of that rut. 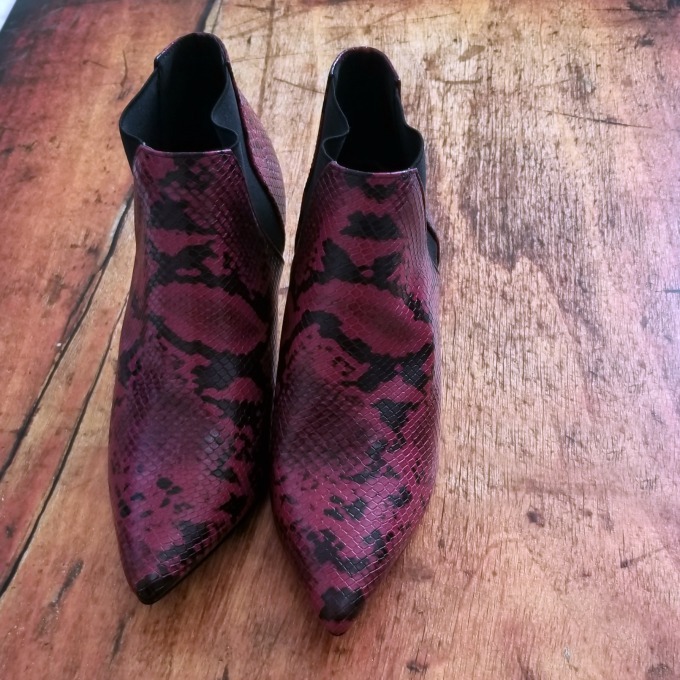 These amazing snakeskin print booties are one of the first adventures in wearing non-flats. They’re made by Shoe Republic LA and came from Lulu’s. 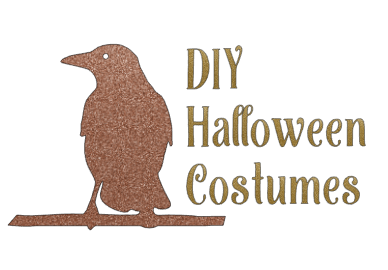 The colors are kind of a dark berry, almost burgundy-red shade with black, and so hot. They look amazing with a great dress, jeans, or even slacks. I actually wore these stiletto boots for new Year’s Eve. 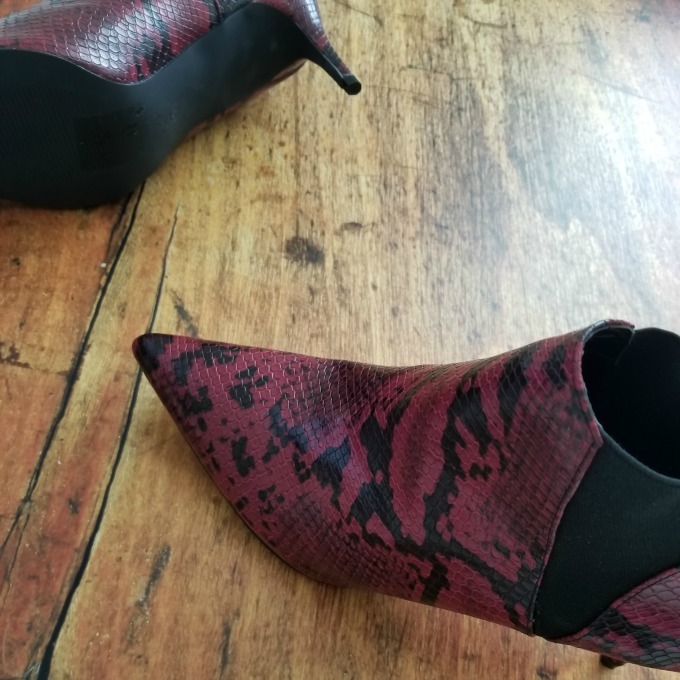 I chose to pair the faux snakeskin booties with skinny jeans and a black sweater. The best part? 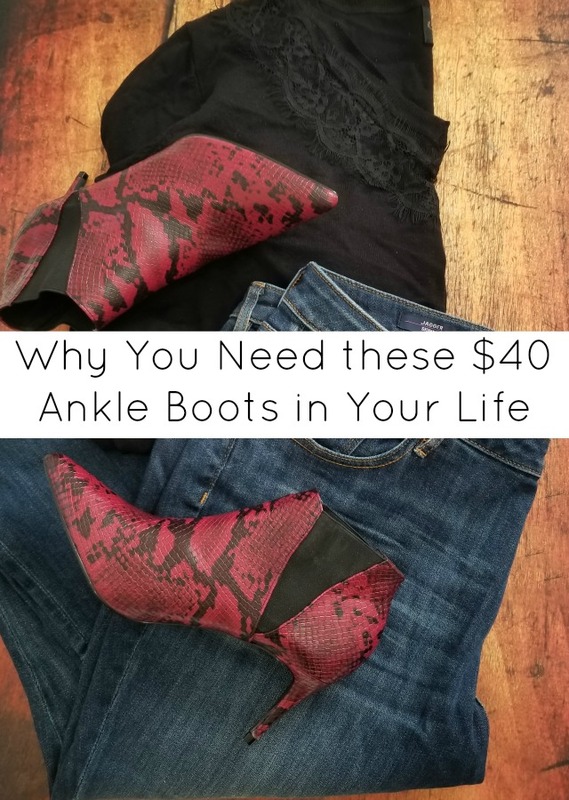 These ankle boots are so affordable! I’m talking under $40 affordable. They’re made from vegan leather, and have a super chic pointed toe. The covered stiletto heel clocks in at about 2 3/4 inches, to give you a nice lean look, but they’re not too difficult to walk in. 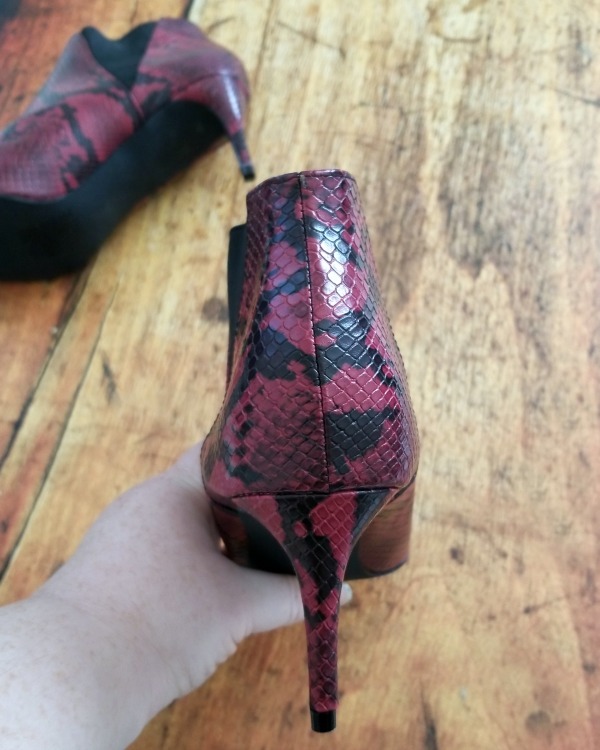 The elastic gusset helps with getting the ankle boots on and off. While they’re amazing for date night, they’re perfectly at home in an office environment, too. One caveat – if your feet are a little on the plumper side, you may want to go up half a size or so. It just makes these fab booties easier to wear. You’re totally going to want to pick these up and add them to your wardrobe. You can thank me later.